It is the primary mission of John Glenn High School staff, parents, and community to teach all students to become successful ROCKET (Respectful, Organized, Cooperative, Knowledgeable, Enthusiastic, Trustworthy) learners. Two John Glenn DECA students were 2-time DECA State Champions this year and qualified for the International Career Development Conference in Atlanta, GA. they were named as finalists and placed Top 20 in the world!! 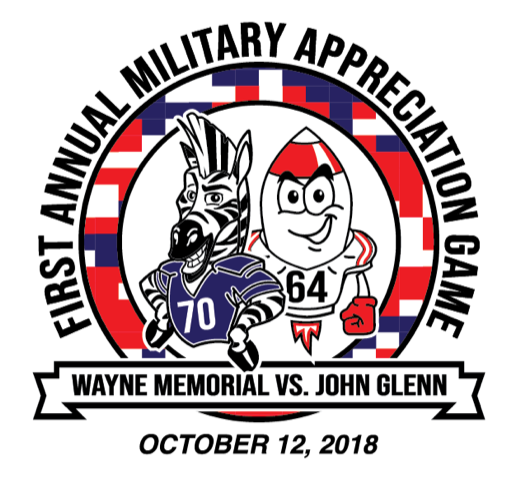 The Wayne Memorial vs. John Glenn football game this Friday is the first Military Appreciation game. In honor of this game, the John Glenn Gantry is selling t-shirts with the following design on them for $10. Each t-shirt purchase enters you into a contest to win a free Gantry gift card. In addition $4 of each t-shirt sale will be donated to a charity that helps our military veterans. If you would like to purchase one, please email me your size (Small - XXL) and location at Central Office. I will have the students personally hand deliver you one to your office. As of now, we only accept cash, we are still waiting on getting the credit card system set up. Thank you and happy Wayne vs. Glenn week! 12th Grade Report to school at 11:45 for a senior assembly. The Westland Police department is committed to helping keep our community safe. If you have any information that you want to share with the police, please message them at schooltips@wlpd.net. Anonymous tips will be accepted.